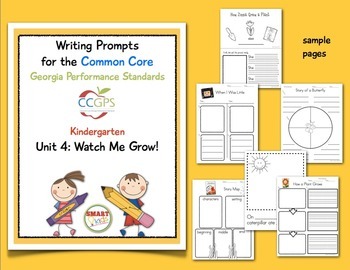 If you are a Kindergarten teacher following the model teaching units provided by the Georgia Department of Education, then this collection of 40 writing prompts is for YOU! These pages follow the suggested writing prompts and assessments in Unit 4, “Watch Me Grow!” The pages are simple and kid-friendly. Choose the pages that best match your instruction and students’ abilities. I hope this collection saves you planning time and helps your kinders make writing progress. Happy Teaching!